Manchester United forward Anthony Martial has reportedly ‘binned’ contract talks with the club for the time being because of manager Jose Mourinho. The France international has not featured regularly for the Red Devils under Mourinho, playing just once so far this season. Despite this, it had been reported by several outlets, including Calciomercato yesterday, that Martial was looking set to put pen to paper on a new contract with United. This may not be the case, however, as another report now emerging from the Sun states that the 22-year-old is reluctant to commit his future to the club while he is not a regular starter and he’s waiting to see what happens with Mourinho. The Portuguese’s future could be in some doubt after some poor results this season, with plenty of talk that Zinedine Zidane could be waiting in the wings to replace the 55-year-old. The Daily Mail are among the sources to report of Zidane wanting the United job, while those close to the Frenchman have told CaughtOffside that he has already spoken to United players about the possibility of replacing Mourinho. From MUFC’s end, however, it seems they are continuing to back their current manager for the time being, with the Mail again among the sources suggesting his job is safe. However, if this means potentially losing a top young talent like Martial, United may want to reconsider. The former Monaco starlet is undoubtedly a world class attacker in the making, having burst on to the scene at United as a teenager but going backwards since Mourinho replaced Louis van Gaal in the dugout. This is just the latest example of Mourinho failing to recognise a youngster’s potential, with the former Chelsea boss having overlooked the likes of Kevin De Bruyne, Mohamed Salah and Romelu Lukaku during his time at Stamford Bridge. 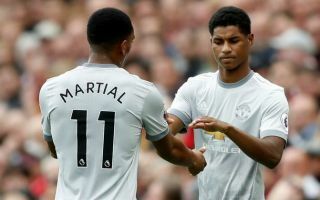 It’s easy to imagine Martial could fare much better under a manager like Zidane, so United fans, among whom Martial remains very popular, may hope this latest development can be enough to push the club’s board into making a change.